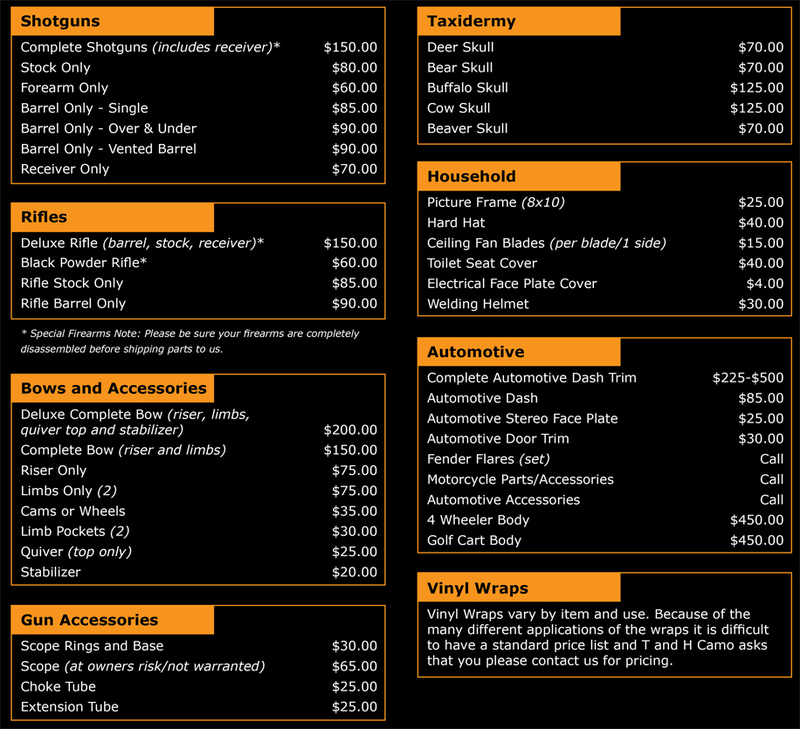 Our price list shows that we are competitively priced with other vendors on the web. We have tried to take all questions out of how much it will cost to perform our services. It is impossible for us to include all of the items that we could dip or wrap on this page. If there is a specific item you would like a quote on, please feel free to contact us. Please take the time to download our order form and include it with the item(s) that you wish to have us process. Here at T and H Camo we take pride in our work. We have spent many hours working on and training for the procedures that we perform. Unfortunately, we are not gunsmiths or mechanics, and ask that any items to be processed are torn down before shipping. Please send only the items to be done. This will protect our clients and T and H Camo from any errors in the re-assembly of the items, and reduce shipping costs. Click here for Order Form. Here at T and H Camo we stand behind our work and guarantee that you will be 100% happy with the work we do. What we can't guarantee is that optics labeled as "waterproof" will indeed stay that way. Our dipping process includes full submersion of the item to be coated. Therefore we can not be held liable for any damage that may occur to the optics as we cannot guarantee that there is not a flaw in the items. If you have optics of any kind that you wish to have dipped please download the scope waiver form and send it along with the item. Click here for Scope Waiver Form.